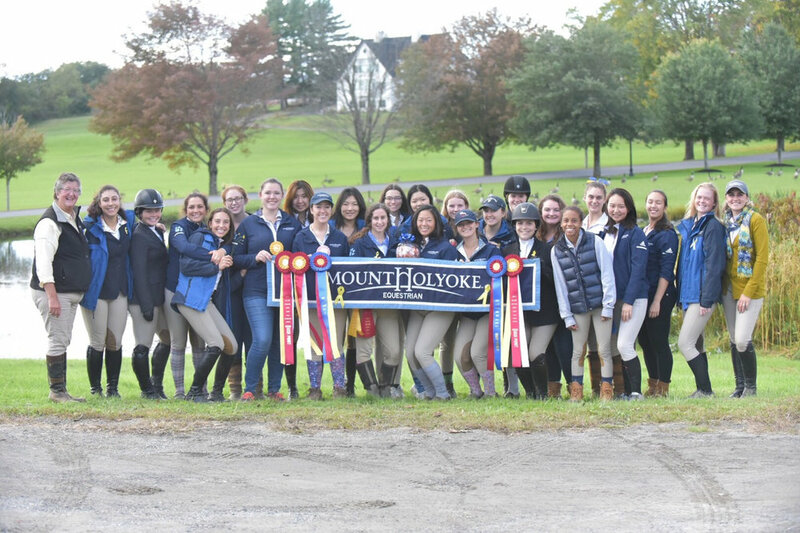 At the Smith College Show on Saturday, Sept. 29, the Mount Holyoke Equestrian Team placed first with 38 points in a field of eight colleges. Trailing the Lyons by one point was the University of Massachusetts, Amherst, followed by Worcester State University in third place. Amherst College finished next in fourth, followed by Hampshire, Smith and Williams Colleges tied for fifth and Bennington College in sixth. The athletes had a successful show all around, and riders Tess Ahlers ’19, Lily DeBenedictis ’19 and Daisy Sears ’19 clutched regional qualifications early. Emma Recchi ’19 and Rachael Fulop ’19 started off the show with a second and third-place finish, respectively, in Open Fences. After the sections of Intermediate Open Fences and Intermediate Flat had competed, riders Sears, Sara Hearn ’21 and Indra Rapinchuk-Souccar ’20 placed second, first and first in their respective categories. Many more riders contributed to the Lyons’ season-opener win. Piper Lacy ’22 won the overall high point of the show, and riders Sears and Faith Wang ’22 were also named high point riders in their class. Although they performed well in their first show, the Lyons’ season has been affected by the passing of Mika McKinney, a 2018 graduate and former rider, this September. She was a Hunt Seat Varsity athlete and also a captain of the dressage team. To honor her memory, the team started the hashtag “RideForMika” to honor her at every show in which they compete. Lyons Equestrian has their next competition on Oct. 13 — the Williams College Show hosted at Bonnie Lea Farm.